I had this post on hold from a table I did some time ago. This one is not a Thanksgiving-oriented set-up, but it will be a good one to keep in mind for those days in January and February when you want to create a peaceful winter tablescape for entertaining after the hectic holiday season. 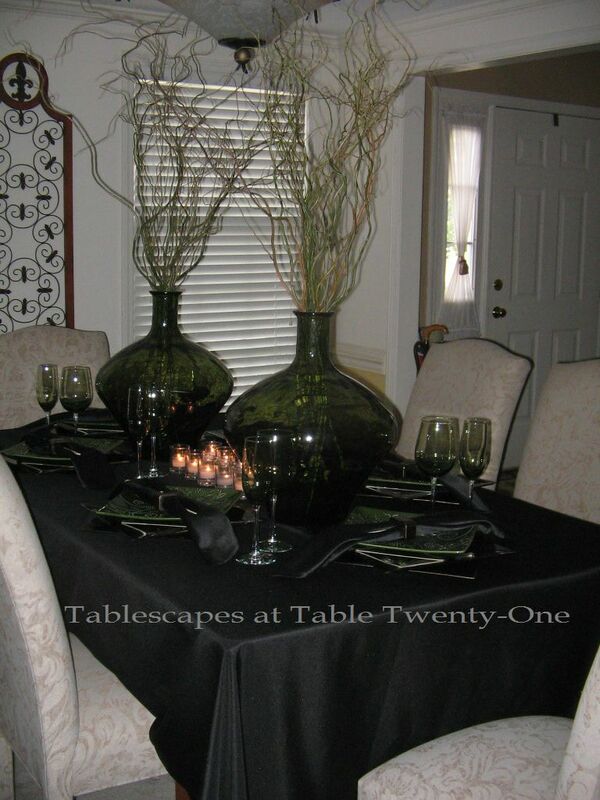 I started with a sleek black full-length table linen. I bought these fabulous dark green Home Essentials & Beyond “Montclair Collection” dinner plates at Marshalls awhile back. I so love the intricate raised design! My hesitation in using these lovely plates sooner has been in what to pair with them. The black linen inspired me to use a black charger, but I knew it would disappear. The addition of the cool square copper-colored chargers made all the difference!!! I wish I could tell you where to get the copper chargers, but I bought them wholesale and don’t know where they are sold retail. The black chargers are from Wal-Mart. I set the double chargers in an offset position to show off all three layers. For this dinner we were eating Chinese takeout, so a pair of chopsticks were the only eating utensils necessary. I nestled them in the crevice of sleek black napkins pinched with copper-colored napkin rings (also purchased wholesale) and draped across the plate. So I finally got hip to Dollar Tree. It’s about time, huh? My Mom called and said there was some beautiful dark green stemware there that I just MUST see, so off I went! Lo and behold, there was stemware that would work perfectly with the plates! Hooray!!! I scooped up a dozen each goblets and champagne flutes, and the cashier gave me the ugliest look I’ve ever seen when I got to the counter. She was NOT happy about having to wrap all of those, even though I brought along my own bubble wrap and box! I bought these uber-cool dark green Vidrios San Miguel vases (made of recycled glass!) at TJ Maxx awhile back. LOVE THEM!!! They’re huge and they really make a statement on the table! To go with the sleek, zen feeling of the room I just plopped in a few branches of fresh curly willow for a cool and easy centerpiece. I used a double row of votives between the two vases of curly willow to lend continuity to the look of the centerpiece and add ambient light. I repeated the oblong votive treatment on the buffet behind the dining table for a sleek, easy look with lots of character! I’m joining Susan and a bunch of really talented tablescapers from around the globe again this week for Tablescape Thursday. Please join us! 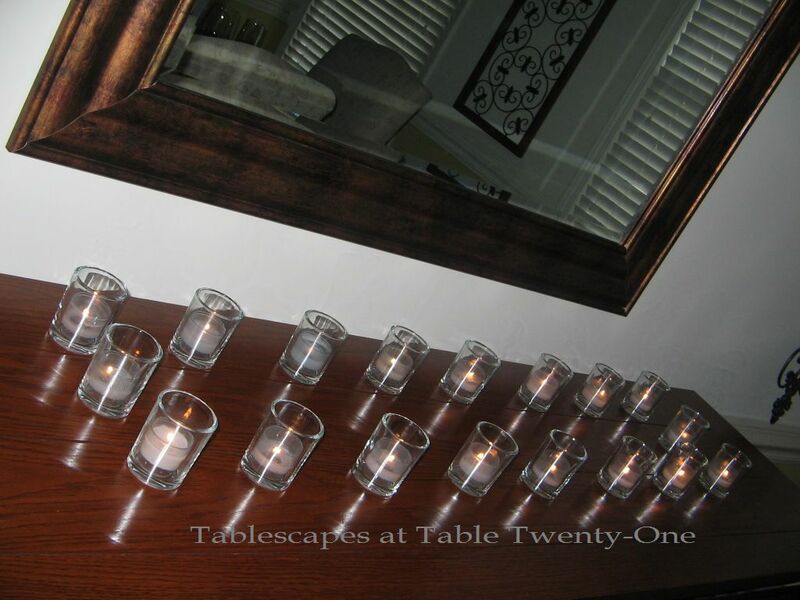 These colors along with the votive candles give your stylish table a peaceful elegance. Love the jumbo vases! Whoo… very elegand setting for Chinese takeout, and I love it. 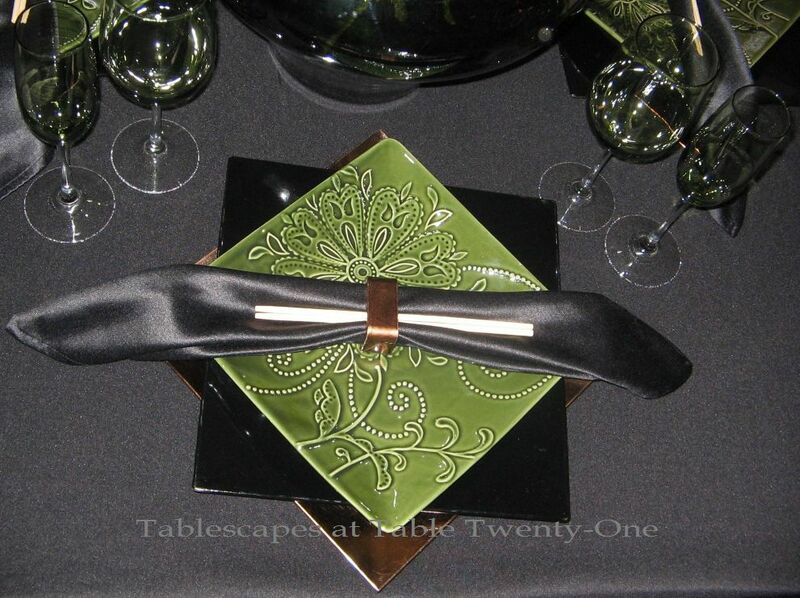 Love the square green plates and green stemware. So sorry you’re still sick. Hope the doctor gives you something to make you ‘all better’. Yikes, you are still sick, that stinks! Love the color combo, and those green glasses are from the Dollar TREE? Or is it another one of the dollar boutiques??? I have never seen them here. Sorry you are still not feeling well…that stinks! I love the black and green on your table, very classy. Those large vases are amazing and the curly willow branches are perfect in them. A good friend of mine had a curly willow tree that she had to have cut down a few weeks ago, so we were out there clipping off as many branches as we could store. Scott still looks at me a little funny when he has to walk around my 3 large buckets of branches down stairs (hee hee) I keep telling him I have BIG plans for them, he’s just going to have to wait! Love those Dollar store stems too, our Dollar Tree stinks…we never have any of the goodies that everyone keeps finding…I think I am going to have to branch out and find another one! Thanks for sharing your table! Hope you feel better soon! Sorry you are not feeling better. We have that going around here too. Your post s are always different inspiring. Sometimes I feel like I can’t compete as there are so many great tablescapers but your comments keep me going. thanks for that. I haunt my thrift shop weekly ,find something cute and go from there. I don’t know why I missed this posting! This is an elegant table! The double charger stack is a novel idea! Love those giant green vases with the curly willows! They make quite a statement! 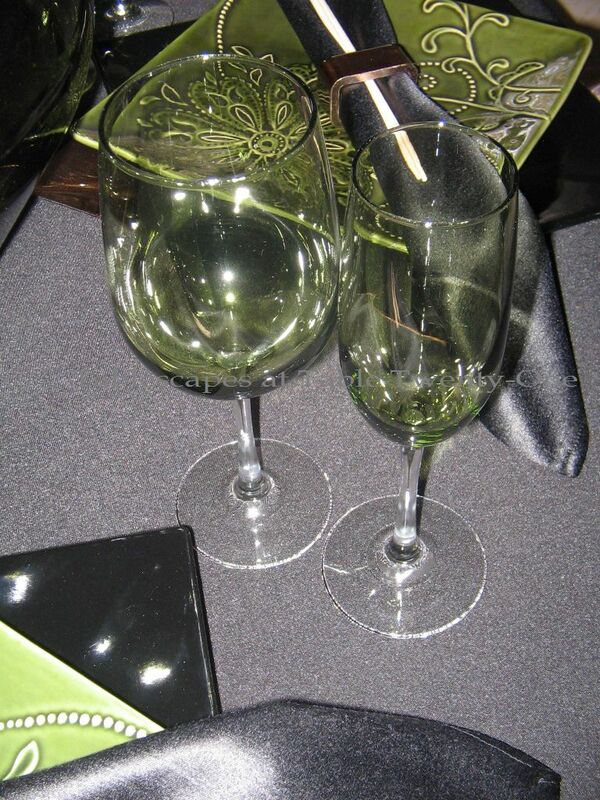 Lucky you with the green stemware! It’s kind of funny at the dollar store how unprepared they are to take care of a customer with a lot of dishes or glassware. I got a lot of looks last time I was in because it took the cashier more than 30 seconds to wait on me!! I hope you get better quickly! Hi Alycia! Love this table, my dear! I used those same green glasses on my Dollar Tree tablescape, when I first started blogging! LOL! Aren’t they fabulous?! They also had them in a pretty purple; and when I went back to get them, of course, they had sold out! (I am still kicking myself for that one!) As always, your table is just gorgeous! Keep it coming!! Dollar Tree is the greatest thing since sliced sourdough bread! I’ve had more luck finding colored glasses there than any other place. Often they have a good selection of dishes also and for a buck you can’t beat it. I adore those green plates and the way you offset the chargers. It really is a peaceful setting. Alycia, This is such a unique color scheme…I love the centerpieces particularly. Hope you are feeling better very soon. I hope you feel better soon! I have had a cold this week and feel so worn out! I love this table – it is peaceful and dramatic at the same time! Those vases are gorgeous!!!! By the way, I have been learning how to block big brimmed hats for Spring for my online store The Chapeau Chateau and remembered you said you go to the Derby every year. I will let you know when I put some up for sale! Take care of yourself and hope you are “in the pink” soon! Those salad plates are beautiful and what a deal on your stemware!! I hope you get better. I’ve been taking elderberry and drinking tea with local honey almost daily! My allergies are just about to due me in! Hi Alycia~ I’m sorry you’re still battling an upper respiratory infection~ you obviously needed more than one margarita last week 🙂 Love the impact your glass vases filled with curly willow make on the table! 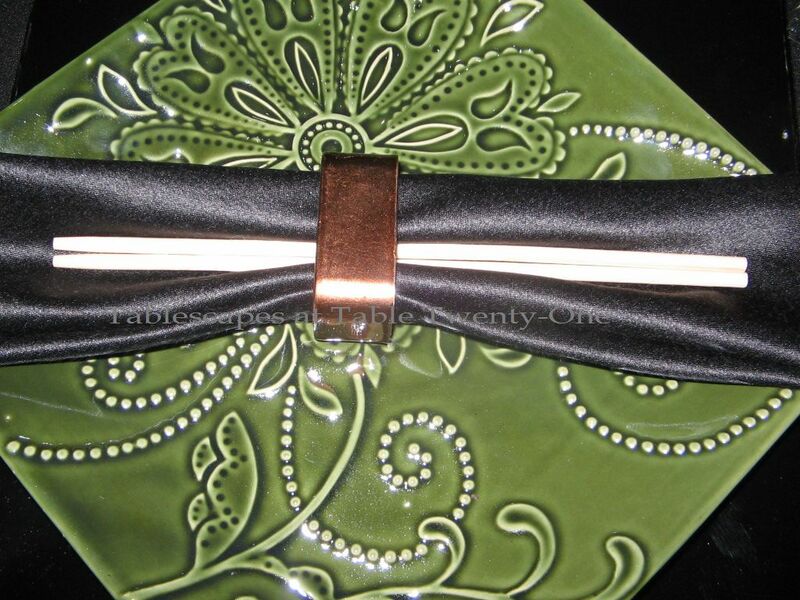 Your green plates with their embossed relief are wonderful and especially pop on your black tablecloth. Hope you feel better soon! Alycia.. your green and black is fabulous! so elegant and stunning. offsetting the chargers…well fabulous! And the large green jugs/vases are amazing pieces. I love this table.. thanks so much for thinking of us despite your lack of being able to get a full breath.. well you are too good to us! I am praying for a thorough recovery.. and soon too! Hurry up and get well so you can enjoy your Thanksgiving … (or maybe this is a ploy to have a restful holiday?!!!) I do hope your recovery is quick and complete and that you have a Happy Thanksgiving. Your table looks great. The copper chargers were the perfect addition, and turning the chargers to offset them was exactly the right look. Love it! Such great colors — and great DT glasses. You’ve probably seen my matching goblets. I’ve used them in several tablescapes, and they’re really great, aren’t they? Table is exquisite. I’m glad you didn’t let a little thing like breathing get in your way! So classic! Such an elegant element to the table. Beautiful! Alycia, sorry you are still fighting that nasty bug! But I am loving this table…I absolutely love green, in any shape for fashion. You will be proud of me, I finally posted my first tablescape to my blog this week…my hands were actually sweaty as I hit publish! I wanted to tell you thank you for being so encouraging, you have no idea how much that means to me! You are so funny! I hope you feel better and kick that bug to the curb. Cool table — our DT has nada — never found a thing. I always see great stuff on the blogs. Smart — taking your own bubble wrap — gonna file that one away. I would descibe this table as VERY high drama! 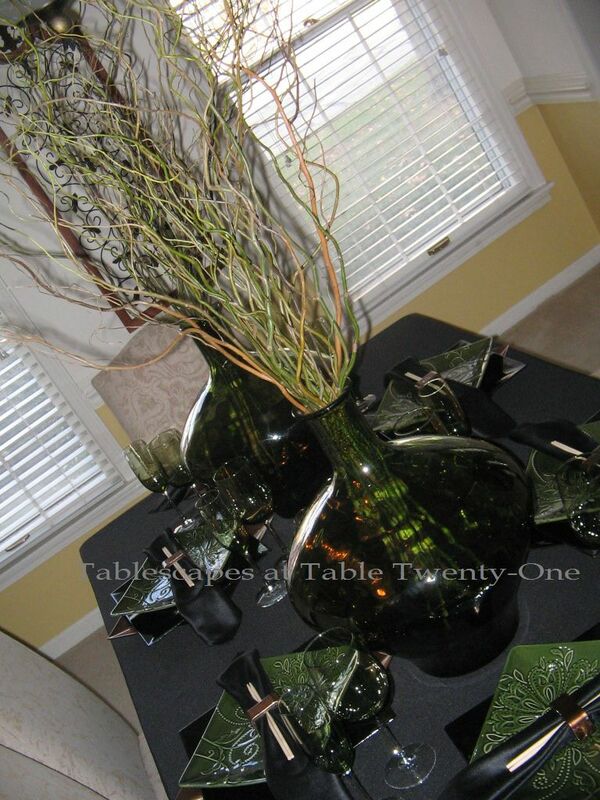 The black and green looks so sophisticated, and your centerpieces are FABULOUS! I have those same Dollar Tree glasses and I intend to get a lot of miles out of them! 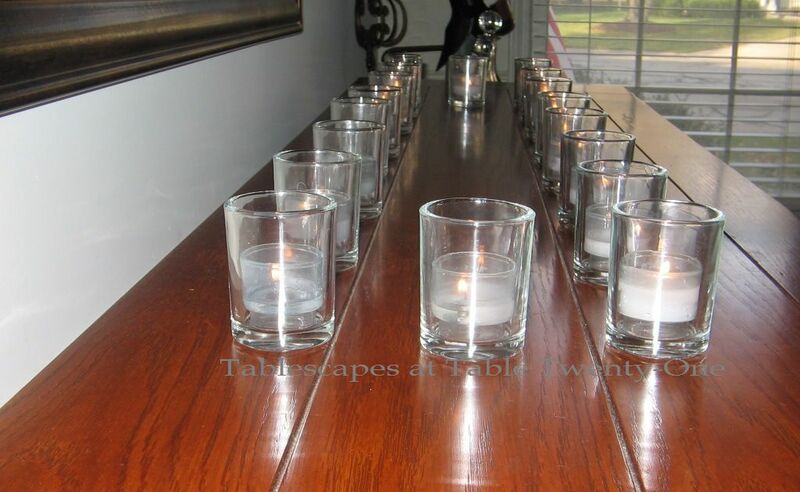 LOVE those satin napkins and sleek napkin rings, and the artful use of votives. I’ll take egg drop soup and cashew chicken, please! Thank you so much for your kind comments…so sweet. Have a blessed weekend. 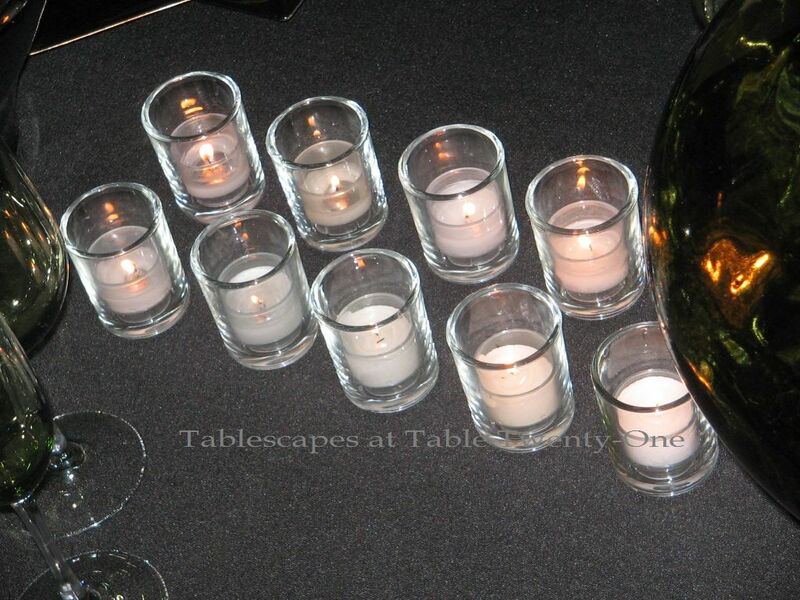 This Tablescapes is Beautiful with the black !!! You did a lovely job putting this all together for your dinner party. I also would like to thank you so much for your sweet comments on my new Tablescape. I hope you and your family have a great Thanksgiving Day sweet lady. This Tablescape is Beautiful with the black !!! You did a lovely job putting this all together for your dinner party. I also would like to thank you so much for your sweet comments on my new Tablescape. Your right, perfect for January, with still a little New Years celebrating going on. I love how your tablescape is elegant and festive, love the china and color. Beautiful. I chuckled at your comment on waiting till after Thanksgiving to do your Christmas shopping. I have to get out there early, The Christmas season is my favorite so I want everything done by Thanksgiving and then enjoy my parties and planning my menus, otherwise I feel I’m behind. Your lovely table reminds me of a walk through a lovely green forest. I say this cause I just walked through one and your tablescape brought it to mind. The table is beautifully styled and the twigs in the centre make it look so seasonal. Thanks for your lovely comment on my blog and thank goodness for the blogging sisterhood is all I can say. I’m in love with those green vases and plates!!! The whole table is like an elegant world fusion which I adore!!!! It’s the post right before my most recent tablescape. You’re one of my tablescaping heroes, so when I won the award I definitely wanted to add you to the list of folks I then in return awarded!!! I’m so sorry if I didn’t tell you already…..I’m such a ditz sometimes…. Beautiful! The black and green are beautiful together! Love those green plates! Nice job! Holy cow, this is soo pretty! Sorry you haven’t been feeling well, get better soon. I had to laugh so hard on your comments on my husband’s post. I read them all to them and it was fun having him laugh too.